I once heard it said that the ministries of the Church have three directions: 1) to the world, 2) to itself and 3) to the Lord. At the time (circa 1984), I thought that observation was particularly appropriate for Christian songwriters. 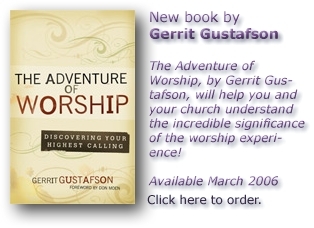 Worship music had not yet gone mainstream – Christian music creators were primarily interested in music for Christians. With the “three-directions” insight, I found myself encouraging other songwriters to get to work on the other two directions of songs: to the Lord and to the world. A “worship movement” was waiting in the wings, and, for many of us, the fascination with “God-ward” music as a musical genre was plenty to work on. I remember the early terms and phrases we used to give distinction to the genre. “These songs are not just about God, but to God.” I have now come to believe that we tended to make too big of a distinction between vertical (“to the Lord”) and horizontal (“about the Lord”) expressions and unwittingly diminished the value of the horizontal. I eventually realized that the songs in Scripture are very fluid as they move between the vertical and the horizontal. Take Psalm 104 for example: “You are very great. . . . He wraps himself in light . . . He set the earth on its foundations . . . You covered it with the deep” (verses 1–2, 5–6). The psalmist easily moves back and forth between the Lord as “You” and the Lord as “He.” Even heaven’s great “Holy, holy, holy, is the Lord God Almighty” is horizontal. The legacy of the worship movement, I believe, will not just be the popularity of what we term “vertical” music, but of a more pervasive “God-centeredness” in music that can help us in all three directions of music ministry. I think we’ll eventually come to an understanding of worship based on the worldview that God is to be glorified in all spheres of life – not just in the church - and that the true worshiper is one who is busy about that task. And that brings us to the third direction: to the world. For many of us, our service to the world is one-dimensional: they need salvation, we’ve got the gospel, so in sharing the good news we fulfill our relationship to the world. After all, didn’t Jesus tell us to do just that? “Go into all the world and preach the good news to all creation” (Mark 16:15). For songwriters, that translates into the mission to make every song you write into an explicit message about God, and to hope that somehow the world will hear it. But there is another very important dimension of our ministry with the world. It is the implicit message of God’s light shining through our lives. Jesus spoke of it when he said to let your lights shine before men that they will see your good works and glorify your Father in heaven (Mt. 5:16). Learning to communicate the implicit message of the gospel is like providing them with fruit rather than just seeds. The implication of this for Christian songwriters is that we need to be writing songs about life – songs about how life is different with God as the center. It’s as though somewhere in the past, the world’s songwriters said something like this to the Christian songwriters: “You write songs about religion; we’ll write songs about life.” And for some unknown reason, the Christian songwriters (and producers and program directors) agreed to it. I’m encouraged because I hear so many able writers and teachers promoting worship as a lifestyle. I’m encouraged that I’m finding an increasing number of Christian musicians who have a genuine desire to let their lights shine into all the spheres of life. But I’m still discouraged because I don’t see that that thinking has translated into a broader range of subjects for Christian songwriters. We think new but act old. Scripture itself is about “everything we need for life and godliness” (2 Peter 1:3), not just godliness. “Whatever is true” – Paul’s instruction in Philippians 4:8 as to what we ought to be thinking about - entails a broader range of subjects than what you hear from Christian publishers. In Saul’s day, the song on the street was about a heroic leader (1 Samuel 29:5). “Let him kiss me with the kisses of his mouth” is not from some slinky new TV show; it’s the opening line from the Bible’s ultimate song, the Song of Songs – a book in the Bible, by the way, that has no mention of God in it. This larger view of how we can glorify God through our songs will not only provide new layers of witness to a darkening world, it will also help sustain the values within the Christian community and strengthen and undergird our unique culture, as well as give breadth to our worship.